Last Saturday we watched MI-4: The Ghost Protocol. Like all the other movies of MI series, MI-4 too lived up to the expectations of the audience with its power-packed innovative action sequences, specially the one from Burj Khalifa and the other one executing a visionary illusion were simply stupendous in making an impact. While watching the movie, I was feeling amazed at the fitness level of Tom Cruise at the age of 49. The way he performed all the stunts was truly remarkable and will put anyone half his age to shame. I am already ashamed of the unfitness my sedentary lifestyle has caused to me at this young age. Dread the consequences to follow in future. Life was way better in all aspects when I used to play hide & seek scampering from one end of our locality to another in search of friends in hiding. I used to be agile like a dog, in a good sense. 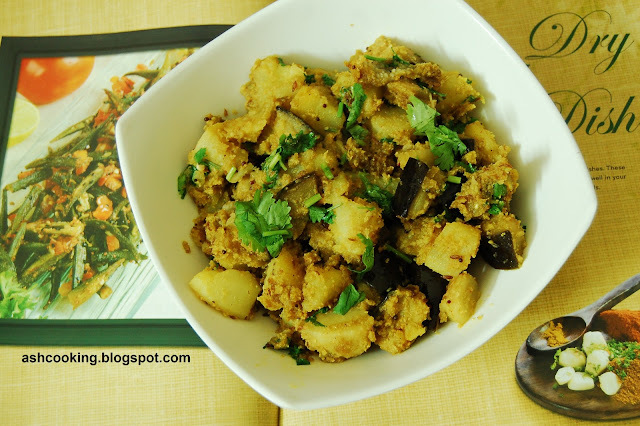 Back to the recipe, Potato Eggplant Curry is a flavoursome veg curry to have with rice or chapati. This aloo-baingan concoction with the help of coconut to enhance the taste further works like a miracle to win the hearts of even the finicky vegetable hating people. 1) In a blender, grind green chillies, ginger paste, garam masala powder, coconut & a little water to smooth paste. 2) Heat oil in a pan and when oil turns smoking hot, temper the oil with the ingredients for sauté and allow them to sputter. 3) Add potatoes and cook them on medium heat till potatoes turn a bit tender. 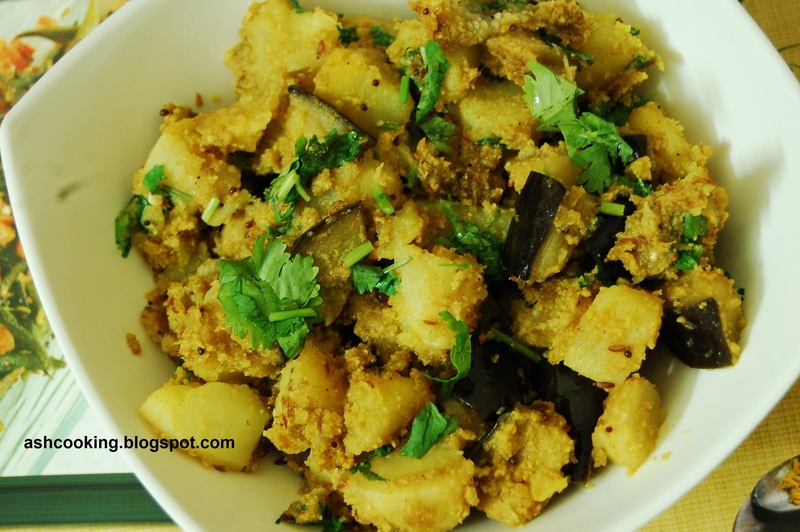 4) Add the paste made in a blender, eggplant, turmeric powder, coriander powder and salt. 5) When vegetables are cooked through, add the coriander leaves and stir to mix.